Made of Imported European Pre-polymer Foam! 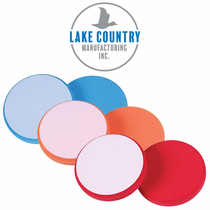 Lake Country Hydro-Tech Pads are closed cell pre-polymer foam. Closed cell foams reduce polish absorption into the pad keeping polish on the working surface for optimum performance of both pad and polish. High strength, tear resistant foam. Benefits: Color: Cyan – Heavy polishing foam designed for compounding and swirl removal. Used to restore oxidized and heavily swirled paint. Color: Tangerine – Light polishing foam for light to moderate defect removal and polishing. Slightly less aggressive than our Orange foam. Color: Crimson – Ultra finishing soft foam designed for applying waxes, glazes and sealants.